The end of the year is nigh and my ever truthful Bowen therapist says I am tired. It’s not a comment on the way I look but a factual statement. “Most people are tired or stressed or depressed,” she says. That’s probably true but I still want to distract her and deny it. “My daughter woke me in the night, I didn’t get a very good night’s sleep,” I tell her. She shakes her head and looks at me pointedly. I’m sorry I can’t hide this exhaustion from her and hope other people don’t notice it too but I don’t really care about tiredness. Feeling weary is so much better than full blown depression and, although I’m feeling tired, I’ve also been feeling suddenly, and inexplicably, content. As well as the Bowen therapy all the hard work I’ve been doing on self-awareness, meditation and mindfulness is probably paying off but it took a long time to kick in. I didn’t do it alone either. My private and group therapy has come to an end but I plan to continue with them both next year because I want that on-going support, I need to feel cared for and I love being part of a group of people who are all on the same path. In our final session for the year our group therapist congratulated me on my honesty and openness, my support of others and for allowing myself to be more vulnerable. That must have been a reference to the session when I blubbered senselessly. I often feel prickles of discomfort or tears in my eyes but I broke down completely in one group session. I can’t even remember why now but I know tiredness brought it on and that tiredness is probably responsible for all our break downs, big and small. So today, although I hope to to do some more vigorous and exciting forms of exercise before finishing the 52 Exercises quest I feel an inner calling to do more of what I really wanted to do when I started my year of trying 52 different exercises. I feel the urge to do some yoga. Best of all I not only feel the urge and hear that inner truth but I recognise it, honor it and follow it. The latter is just what I need but to attend a class I’ll have to leave the house at 6am, miss helping get the kids to school and pay $16 for the privilege. With a bit more research I discover the YogaGlo school in Santa Monica, Los Angeles which has hundreds of yoga videos available to members for a monthly fee of $18. I feel bad about not supporting the local business but the online solution is perfect. It means I can do the class whenever I want in our spare room with no travel time. And I can do it in my underwear if I so please. Which I do. This sounds a bit totally woo woo but I like the picture of the chakras and spend a bit of time exploring what each of them are supposed to represent. It reminds me of what I learned about the second brain and strikes me that the chakras might not be that out there after all. In fact there could be a lot of truth in the idea that there are energy fields focused down the center of our body which need to be kept healthy and in motion. After all that’s where all those nerve endings from the brain stem are dangling and that’s why we feel emotions in our belly, chest and throat. So early the next morning I sign up to YogaGlo, enter over my credit card details and choose a Start Your Day with Connection & Peace video. The teacher Kia Miller doesn’t have the Californian accent I was expecting. In fact she sounds as British as me. She’s wearing a white yoga outfit and a half turban thing and, on my iPad at least, she’s small enough to sit on the palm of my hand. I realise there isn’t going to be the same connection there would be if I was actually in the room with a teacher and other people but I’m happy to be wearing my comfy undies and not to be distracted by other people. The class starts off with gentle breathing and centering but things get moving fast. In a bid to clear out bad energy, release good energy and get all our energy flowing merrily along we’re trying to work on all our chakras. Well, that’s my interpretation of what Kunalini yoga is. Kia tells me to close my eyes and look to the third eye. We do a lot of vigorous repetition of movements, for example standing with our arms over our heads then bending right down to touch the ground as we exhale and inhaling as we stand up again. Then repeat for two minutes. It definitely gets the energy flowing. I suffer the usual distractions, checking the clock a few times to see how long is left as I’m feeling tired but I delight in the bits that I can feel are giving my bum a good work out and I enjoy Kia as a teacher. She is encouraging, friendly and stunning without being annoying. We spend a bit of time squeezing our pelvic floor and Kia has a special sanskrit name for the area. I think the aim is to harness the energy down there and get it flowing upwards to our entire body instead of just pooling around our loins. There’s no doubt by the end of the session I can feel the energy vibrating upwards from within me. The class is over now and we end with a meditation. The sky outside is blue, the birds are trilling and my family are starting to move around the house. Kia talked a bit about finding your truth and connecting with that. I was feeling fairly harmonious before I started the session but I feel even better afterwards. I’m not really worried about finding my inner truth either. Today I’m not concerned about inner truth at all. I’m not thinking about if I should start a new business, move house or work harder to help and nurture my teenager. I’m happy to just be. Today I’m not worried about anything or looking for anything at all; maybe that’s how you know when you’ve finally found your inner truth. Have you ever had that aha moment and felt like you’ve finally found your inner truth? Kundalini yoga was 49th different exercise I’ve done this year. Check out more stories from the 52 Exercise quest now. Stay HOT with the FREE weekly newsletter. It’s unique content you can’t read on the blog. Click here to subscribe now. Native Californians have an accent? No we don’t. Yes I know, haha. You’ve a perspective. Still, our son (also a native Californian) went to school in Brisbane and Melbourne for a year. While there, he never could figure exactly WHY he always got called out right away as being from Cali. I so relate to the general feeling of tiredness that can pervade us. It attacks me in times of stress. Last week saw the end of a beautiful 5 month relationship which left me reeling, questioning, naval gazing and vulnerable. Support from those I trust (yep they ‘call me’ on it when I need it) and my own processes are seeing me improve every day. I felt that terrible tiredness, like I was caught in a web and it seemed too much trouble to move… gradually I have taken myself gently forward and taking action, not isolating and doing something. Extending a hand of friendship and donating some Christmas decorations to someone in need helped me put ‘my stuff’ in perspective. My latest blog post shows that, speanding time with my young granddaughters helped me immensely. I had Bowen therapy a couple of times about a decade or more ago. It was the best. The best. She moved away & I never did it again. She had the capacity to reduce me to tears in about 30 seconds flat. But the good years, like someone really understands you. A couple of things stuck with me funnily, that I had the tightest amount of stress carried in a neck she’d ever seen (who says I can’t excel at something) and I could live on lettuce leaves and still be fat. Sadly she seems right on both accounts still today. Ha ha. But to answer your question, yes, I have found that nirvana, that inner peace once. It was so splendid, I’m on an eternal quest to find it again. ;-) Funny you mention the chakrahs. I’ve had an open mind and delved into angels, spirit guides, philosophies, meditation, auras, you name it. And always thought chakras were perhaps a bit out there. Because you know, there’s only room for so much woo-woo at one time. BUT…I am a big believer in energy & healing the body due to hurts, physical & emotional. And when I finally discovered more about the chakras, and what do you know, they seem to encompass everything in a tidy, easy to understand package. So now I’m going to add chakras healing to my 2014 healing manifest. 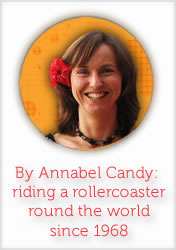 You’ve inspired me to take my own 52 step challenge Annabel. I thank you. I hope to blog about it too. I’m very inspired by what you have achieved for yourself this year, and thank you for sharing. Wow, that’s exciting, I am wondering what your challenge will be and can’t wait to read about it. Bowen has been great for me too. I hope you can find someone else who can work on you.